Anastasia Karanikolaou attended the first day of Coachella Music Festival wearing a Naked Wardrobe The NW Tank Mini Dress ($38.00), Alexander Wang Attica Rhinestone Multi-Pocket Belt Bag ($895.00), Revo Edge Sunglasses ($199.00), Vic + Ko The no. 8 Rings ($55.00 each), Demarson Pave Luna Silver Eearrings ($215.00) and Nike Air Jordan 1 Retro High Sneakers ($160.00). Khloe Kardashian was spotted arriving at Giorgio Baldi for dinner her sisters wearing a Naked Wardrobe Ready To Rattle Dress ($52.00), a Prada Nylon Pouch Bag ($286.77) and Christian Louboutin So Kate Pumps ($710.00 – wrong color). Kylie Jenner posted some pictures on instagram wearing Naked Wardrobe The NW Hole’d It Down Jumpsuit ($40.00), Louis Vuitton Takashi Murakami Pochette Multicolor Monogram Purse (Sold Out), her custom-made Butterfly Diamond Necklace (Not available online), a Rolex Day-Date II Yellow Gold Watch ($34,500.00) and Adidas Originals Falcon Sneakers ($135.00 – wrong color). Kourtney Kardashian posted some pictures on instagram from Positano wearing a Jacquard Tailored Jacket ($470.00) and matching High-Waisted Jacquard Trousers ($295.00) by Sandro, the Naked Wardrobe Knot Your Beach Bikini Top ($45.00 – two piece) and Gucci Jordaan Leather Loafers ($730.00). Kourtney Kardashian posed with boyfriend Younes Bendjima in Italy wearing the Elvi Tailored Jacket ($364.00) and matching Eben 7/8 Trousers ($280.00) by Sandro, Naked Wardrobe Knot Your Beach Bikini Top ($45.00 – two piece) and Saint Laurent Amber Crossover Strap Sandals ($785.00). Kylie Jenner posted some pictures on instagram wearing a Naked Wardrobe The NW Mini T Dress ($38.00), a vintage Gucci Monogram Belt Bag ($379.00), Kendall + Kylie Vivian Sunglasses ($58.00), a Rolex Lady-Datejust Watch ($14,870.00), a Cartier Juste Un Clou Yellow Gold Bracelet ($6,800.00) and Adidas by Raf Simons Ozweego III Trainer Sneaker ($500.00). 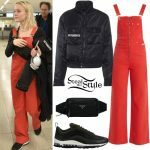 Kendall Jenner was spotted arriving at Charles de Gaulle’s Airport in Paris wearing a Gosha Rubchinskiy x Adidas Logo Cotton French Terry Oversized Hoodie ($200.00), The Naked Wardrobe Oh So Tight Shorts ($26.00 – wrong color), a Louis Vuitton Monogramouflage Passport Cover ($335.00), Givenchy Flat Top Sunglasses ($255.00) and Adidas Arkyn W Sneakers ($125.00). Kendall Jenner was spotted at the LAX Airport wearing a Balenciaga Double-Breasted Shearling Fur Coat ($5,600.00), a Yeezy Khaki Calabasas French Terry Hoodie ($260.00), Naked Wardrobe Oh So Tight Shorts ($26.00), Adidas Low Cut Socks ($18.00 – 6pack), George Keburia Sunglasses ($200.00) and Adidas Originals Forum Low Sneakers ($70.00). Khloe Kardashian was spotted out and about in Tarzana wearing a Naked Wardrobe The NW Ribbed Mini Dress ($40.00), an Unravel Project Long Robe Coat (Sold Out), a Fendi Peekaboo Mini Bag ($3,400.00) with the “Strap You” Shoulder Strap ($1,200.00) and Givenchy Layered Shaft Tall Boot (Not available online). Olivia Culpo posted some pictures on instagram wearing a Naked Wardrobe The Cable Knit Crop Sweater ($34.00), Jean Atelier Flip Straight Jeans ($525.00), a Saint Laurent Sac De Jour Tote Bag ($2,213.00) and Stuart Weitzman Clinger Bootie ($402.50).